What a lovely time of year! I'm joking, of course, because it's the tail end of winter, and we haven't had sun for days! I had to get creative and take some of my blog photos in natural light, but not direct sunlight.They aren't bad, actually, but the pure sunlight would have been so much better! 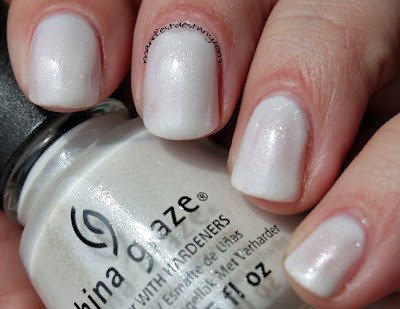 I've got China Glaze Dandy Lyin' Around, from the new Avant Garden collection, for you today! This polish looks like vanilla frosting. I can bet it doesn't taste like frosting. It's a very shimmering white. An opaque shimmering white. I only used two coats, and it was smooth then, too. Application was easy, as the formula is very good (which isn't something I can say for every polish from this collection I have). The shimmer is very subtle - it's not a typical polish. I just can't believe how easy it was to apply. When I saw it was white - and shimmery - I kind of hesitated. But I actually do like this one!